How Far is Elite Acres? Plaza Elite Acres, is a project by Plaza Group, that advertises flats for sale in Perumbakkam, Chennai. These apartments was envisioned to provide a comprehensive living experience. The 10.84 acres wide Plaza Elite Acres is designed with emphasis on spaces with good ventilation, great amenities and affordability. Plaza Elite Acres is RERA registered. It offers flats for sale with different sizes. 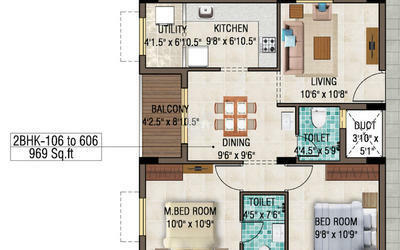 1.5BHK flats for sale sized 627 sq. 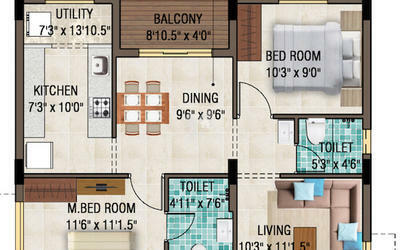 ft., 2BHK flats for sale sized 969 sq. ft.-989 sq. ft. and 3BHK flats for sale sized 1162 sq.ft - 1205 sq. ft., of different orientations. The location of the CMDA approved Plaza Elite Acres, is in Perumbakkam, Chennai, which is a prime location and strategically located and is connected to Tambaram through the Velachery-Tambaram road and to Sholinganallur through the Medavakkam-Sholinganallur road. Almost all other major junctions in South Chennai are directly connected to Perumbakkam. Many International School and good hospitals are located nearby. The project has 70% open space and 30% built up area. There are no common walls sharing. The multiple amenities offered in Plaza Elite Acres are Landscaped Garden, Swimming Pool, Gymnasium, Play Area, Rain Water Harvesting, Lift, Club House, Library, Tennis Court, Cafeteria, Jogging Track, 24Hr Backup Electricity, Basket Ball Court, Drainage and Sewage Treatment, Meditation Hall, Squash Court, Amphitheatre and Open Lawns, Senior Citizen Park, Multi-purpose Hall, ATM, Volleyball, Security and Grocery Store assure the home owners to relax and enjoy in their own home. Convenience store, ATM, Daily needs store, Salon are all Inside the campus. All peripheral walls are 8” thick Aerocon Blocks or equivalent blocks or brick walls of 9” thick and partition walls are 4 1/2”thick brick wall with hoop iron reinforcement or 4 “ Aerocon or equivalent block. All internal plastering are rough trowel finish (with two coat of putty) and External Plastering shall be rough finish. Vitrified tile flooring of size 24” x 24” with matching skirting of 4” ht. Ceramic tiles flooring of 12 “X12” dadooing with 18 “X 12” tiles up to 7’0” height. First quality teak wood frame section and teak veneered shutter with good quality hardware’s. All the bedroom door frames will be chemically treated padak or equivalent with 5”X 3” suitable section .The shutters are with both side commercial ply painted quality Flush doors. The toilet doors will have plastic coating on one side. All the window will be UPVC sliding and will have MS grill as per the architect’s design. French door will have three tracks, three panel’s sliding door without grills. 24 Sqft of black granite counter with stainless steel sink. Exhaust fan opening will be provided. Ceramic tiles dado above the kitchen counter up to a height of 24” will be provided. Loft on one side of Kitchen and one in smaller bed room. All the plumbing lines will be of medium gauge CPVC Pipe (Internally) and P.V.C & UPVC pipes (Externally). All the sanitary fittings such as EWC, Wash basin, will be white colour Porcelain Hindware / Florence or its equivalent make. Tractor emulsion or its equivalent paint in interior and apex or its equivalent paints in exteriors. One number 5 passenger automatic Lift “Johnson “or equivalent for each core. Staircase: State of the art handrails for staircase lobbies. Driveways: Interlocking concrete paver blocks. Plaza group is Chennai's fastest growing infrastructure company which provides real estate solutions. They have about 2 decades of thorough expertise in construction and their primary attention is on the customer needs. Plaza is also making headway in Hospitality and Logistics segments. A reputation for innovation, quality and trust, they develop and build beautiful and affordable properties in the heart of Chennai landscape. Plaza Bounty Acres in Kovilambakkam is a new landmark in Chennai real estate industry by Plaza group which consists of Ready to occupy apartments with different dimensions. They have many completed, ready to occupy and ongoing projects in Chennai. Some of the Ready to occupy projects are Plaza Tranquil Heights in Kovilambakkam and Plaza Opulence Apartment in Perungudi And Some of the one going projects are Elite Acres in Perumbakkam and Tranquil Square in Kovilambakkam and the list goes on. The transparency and progressiveness of the organization has a proven track record of 2000 happy families and are determined to add more. Over the years they have grown from strength to strength leveraging on their innate capacity to see things in new light, bringing a new perspective on things and always staying on the cutting edge. Plaza's focus on building sustainable relationships in their logo. · Their identity has made to express their core corporate values. · The clenched fist signifies strength of purpose and solidity. · The color blue symbolizes depth, maturity and commitment. · The logo also depicts a stylized 'P' which stands for their name- Plaza. · The tagline conveys their brand promise- a summation of all their core values.